Introduction to the pattern book of Messrs. Pilkington & Co., of Clifton Junction, Manchester. "A good foundation may also be made by laying an even bed of bricks, solidly embedded and finished with a cement coating \ inch thick. 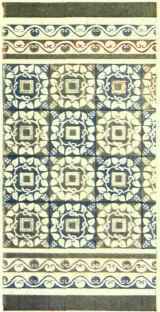 "If the tile or mosaic pavement is to take the place of an old stone flagged floor, the flags will make a splendid foundation when lowered to the necessary depth, and properly embedded and then coated with cement in the usual way. If it is proposed to lay a tile floor in place of a wood floor, this can be done by taking up the old floor boards and sawing them into lengths equal to distance between joists. Fillets should then be well nailed to joists, about 3 or 4 inches from the top. Upon these fillets the short lengths of floor boards should be securely fastened, spacing them at least \ inch apart, to allow for any swelling which might take place (see Fig. 235). If convenient, it is recommended to cover the boards with a layer of heavy tar paper. This will, in a great measure, protect the boards from the concrete moisture, and also prevent any water from dripping through to the ceiling below. This being done, the concrete may be put in and brought level with the top of the joists, and then finished with the usual cement coating (see A, Fig. 202). If tops of joists are chamfered, as shown at B in Fig. 236, or even roughed with a hatchet, a still better foundation is secured, and if the thickness of the old boards which the tiles have to replace is \\ or \\ inch, so much the better, as this will allow for the intervention of about \ inch of bed between top of joists and tile pavement, ensuring a better foundation (see Fig. 237). In such a case it will not be necessary to chamfer tops of joists, but we recommend that they should be roughed. "If joists are of sufficient depth to allow of bridging them, this should be done, and when the strength of joists will permit, in cases where the old floor boards are only about 7/8 inch or 1 inch thick, it is advisable to cut about an inch off the tops of joists so as to get a complete concrete bed (see A, Fig. 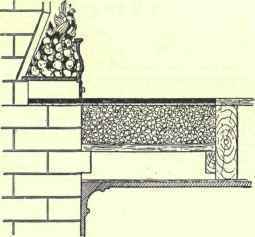 238), or, as an alternative, chamfer tops of joists (as shown at B, Fig. 238). Plate VII. 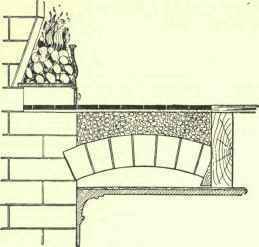 SUGGESTIONS FOR ORNAMENTAL TILES BY THE PILKINGTON TILE & POTTERY CO.
"The foundation for hearths should be of the best concrete upon brick arches, as illustrated in Fig. 239. If this is impracticable, then a sub-foundation of wood may be fixed and concreted upon (see Fig. 240). In this case the concrete should have a thickness of not less than 6 inches if possible, as a safeguard against fire. Another way, and a good one, is to have a strong angular sheet-iron sub-foundation, as illustrated in Fig. 241. 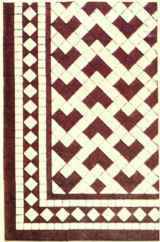 "It should be remembered that tiles and mosaic must never be fixed on boarded floors, unless there is at least 3 to 4 inches of concrete between the boards and tile floor, or the tiles will certainly become loose sooner or later, this depending only on the amount of traffic over the floor. 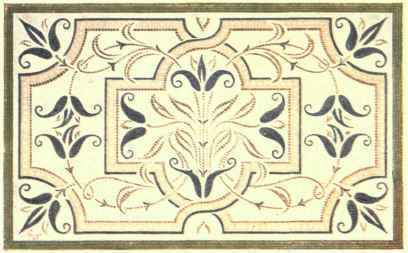 "When it is intended to have a sunk mat space in a tile or mosaic floor, the mat well should be surrounded with a 1/4-inch angle iron frame, securelyfastened into the concrete bed; or better still, it may have stone, slate, or marble kerb about 2 or 3 inches wide and 1 1/2 inch thick. 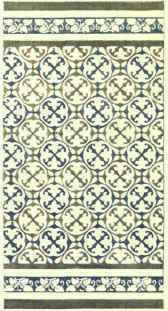 "It is usual to fix perfectly plain tiles into mat wells. Correct sizes and position of these spaces should always be marked on plan. 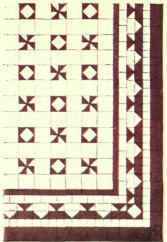 "Where spaces to be tiled are intercepted by steps, the positions and sizes must be shown on plan.